Coryell was born in Galveston, Texas, in 1943, and grew up in the Seattle, Washington area, where his mother introduced him to the piano at the tender age of 4. He switched to guitar and played rock music while in his teens. He graduated from Richland High School, in Richland, Washington, where he played in local pop and rock bands. He then attended the University of Washington (where he studied Journalism). In 1965, Coryell moved to New York City where he became part of Chico Hamilton’s quintet. In 1967 and 1968 he recorded with Gary Burton. In late 1969 he recorded “Spaces”, the album for which he is most noted. It was a guitar blow-out which also included John McLaughlin. His music during the late-1960s and early-1970s combined the influences of rock, jazz and eastern music, and his tremendous versatility allowed him to cooperate with musicians like Jack Bruce, Jimmy Webb, The 5th Dimension, Charles Mingus, Billy Cobham or Chick Corea. He formed his own group (with trumpetist Randy Brecker), The Eleventh House, in 1973. The band’s recordings sold well in college towns, and the ensemble toured widely to support that. Following the break-up of this band, Coryell played mainly acoustic guitar, but returned to electric guitar later in the 1980s. In 1979, Coryell formed The Guitar Trio with jazz-fusion guitarist John McLaughlin and flamenco guitarist Paco de Lucia. The group toured Europe, eventually releasing a video recorded at Royal Albert Hall in London entitled “Meeting of Spirits“. In 2007, Coryell published an autobiography titled Improvising: My Life in Music. Larry’s two sons, Julian Coryell and Murali Coryell are also actively involved in the music business. 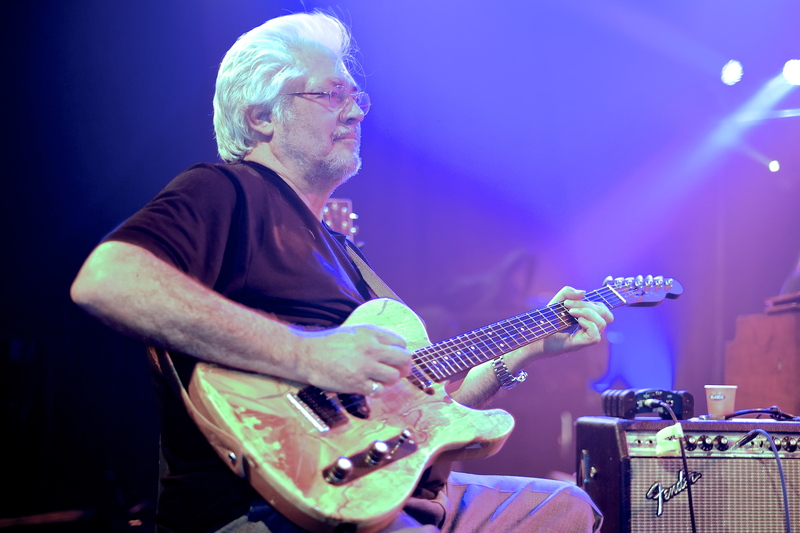 As one of the pioneers of jazz-rock — perhaps the pioneer in the ears of some — Larry Coryell deserves a special place in the history books. He brought what amounted to a nearly alien sensibility to jazz electric guitar playing in the 1960s, a hard-edged, cutting tone, phrasing and note-bending that owed as much to blues, rock and even country as it did to earlier, smoother be-bop influences. Yet as a true eclectic, armed with a brilliant technique, he is comfortable in almost every style, covering almost every base from the most decibel-heavy, distortion-laden electric work to the most delicate, soothing, intricate lines on acoustic guitar. Larry has close to two hundred recordings to his credit. Some of his latest CDs are on Chesky Records (“Impressions”, “Traffic” and “Electric”), Rhombus Records (“Laid Back & Blues”), HighNote (“Cedars Of Avalon”), Favored Nations (“Tricycles”), Random Act Records, (“Duality”), Patuxent Records (“Montgomery”), In & Out Records (“Night of the Jazz Guitars”) and Wide Hive Records (“Wide Hive Players”, “The Lift”).